In our previous post in this series, we highlighted a line of research by Burnside et al. that explains the profitability of the carry trade as a “peso” problem. That is, the historical data doesn’t completely reflect all of the bad outcomes that may arise. The as yet unobserved bad outcomes are known as “peso events”. 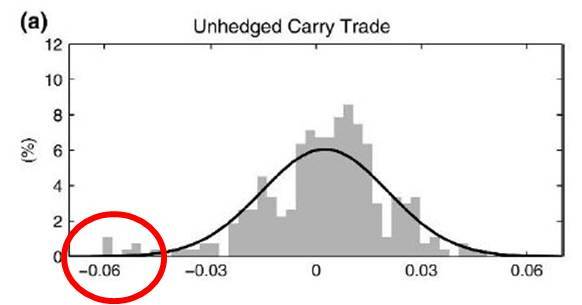 The historical profitability of the carry trade, isn’t the complete story. It’s a biased sample. The few bad outcomes not yet observed resolve the puzzle. Investors are worried about these “peso events” and price the currencies accordingly. There are two different aspects to pricing “peso events.” First, we must assess the probability of an extreme negative event. Second, we must assess the discount we want to apply to that negative event. This second aspect is what we want to focus on. In finance all dollars are not created equal. Cash received in states when the investor otherwise has plenty cash is not worth as much as cash received in states when the investor otherwise is short cash. The standard models for pricing risk – such as the CAPM, the Fama-French and the Carhart factor models, among others – are based on what is called a linear stochastic discount factor across all states. They assume a linear relationship between the discount factor and some underlying risk factor. In the CAPM, that would mean a linear relationship between the discount factor and the payoff on the market portfolio. But there isn’t any natural presumption in favor of linearity in the discount factor. The argument made by Burnside et al. is that the discount factor is not linear. Instead, a very high discount factor is applied to the as yet unobserved “peso events.” And this very high discount factor is essential in making sense of the historic profitability of the carry trade strategy. In a previous post, we reported on the evidence that the carry trade strategy – investing in currencies with high interest rates and borrowing in currencies with low interest rates – earns high returns with low risk. In this post we describe in more detail some of what is known about the risk and return tradeoff on a carry trade investment. Our focus is on the risk and the cost of risk. The returns to the carry trade, like the returns on a number of other trading strategies, are sometimes characterized by the phrase “They take the stairs up, but the elevator down.” That is, the profits accumulate gradually, but once in a while there arises a very, very large loss. 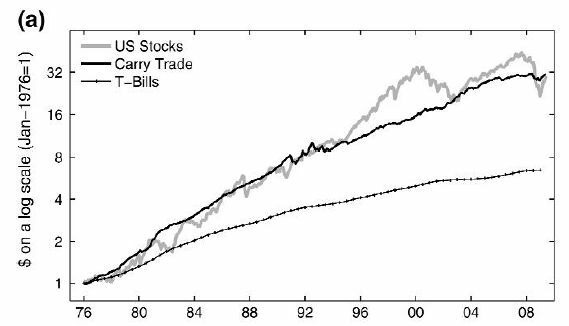 The figure below, taken from a recently published paper by Burnside, Eichenbaum, Kleschelski and Rebelo (here is the free working paper version), shows the distribution of returns to a carry trade strategy between 1987 and 2009. The shaded bars are the observed sample. The black line is a normal distribution with the same mean and standard deviation as the sample. Cash & Carry, #1: Where to Park? Holding cash is a key risk management tool, and corporations are holding more cash than ever. Where should the corporate treasury park that cash? In which currency should these balances be held–US dollars, Euros, Yen, Swiss Francs, Australian Dollars or what? The choice of the currency denomination of cash investments is the flip side of the problem of selecting the currency denomination of debt. Modern capital markets confront corporate treasury with a broad array of opportunities for borrowing and investing in various currencies. Assuming the expected returns in all currencies are fairly priced for risk (i.e., Uncovered Interest Rate Parity holds), the answer will depend on the multinational structure of the company’s business and its exposure to fluctuations in the different currencies. Some companies will be better off stashing cash in dollar denominated securities because they anticipate future net cash outflows denominated in dollars, while others will be better off stashing cash in Euro denominated securities and others in Yen, and so on. Many companies will have an optimal mix of cash stashed in a variety of currencies. We’ll call the company’s optimal mix under the assumption of Uncovered Interest Rate Parity the company’s Benchmark currency portfolio. Other factors will matter, too, such as international tax rules, concerns about capital controls and so on. But what about that big assumption we made up front? What if expected returns in all currencies are not fairly priced for risk, so that Uncovered Interest Rate Parity does not hold? What if investments in certain currencies are generating big profits, while investments in other currencies are generating losses? It is well documented that a speculative portfolio built by purchasing high interest rate currencies and selling low interest rates currencies—the carry trade portfolio—has been very profitable over many years.The figure below, taken from a recently published paper by Burnside, Eichenbaum, Kleschelski and Rebelo (here is the free working paper version), shows the cumulative return to an investment in the carry trade portfolio between 1976 and 2009 as compared against the cumulative return to an investment in US stocks and the return to an investment in US Treasury Bills. I’ve just returned from Europe where I spent part of the summer talking to companies in different European nations. Everywhere I went, the signals are flashing yellow. In Europe, the recovery seems to be coming to a standstill. A poisonous mix of sluggish output, sovereign debt crisis, fragile banks and lack of political will has created a perverse cycle of lower growth, less than expected tax revenues (despite VAT and income tax hikes), obstinate fiscal deficits, growing public debt, more turmoil in financial markets, stressed banks that refuse to ease lending, further austerity and spending cuts, which further undercut business and consumer confidence, as well as disposable income, which lead to yet lower economic growth and so on. It is as if much of the Eurozone and the UK are dangerously balanced on the edge of another recession…without even having been able to recover to the levels of output seen before it all started in 2008. Recent data tells a sad story. Industrial production in the 17-nation euro area fell 0.7 percent in June compared to May. GDP has slowed to a meager 0.2 per cent in the second quarter from 0.8 per cent in the previous three months. Even mighty Germany is decelerating fast, with last quarter GDP slowing to a shocking 0.1 percent, and the latest IFO Business Climate Index shows that German businesses have turned much less optimistic. No question that the coming year will be challenging for European businesses. Many companies have been closely monitoring how the situation is evolving, and are diligently working on contingency plans that deal with possible sinister Eco-Fin scenarios. 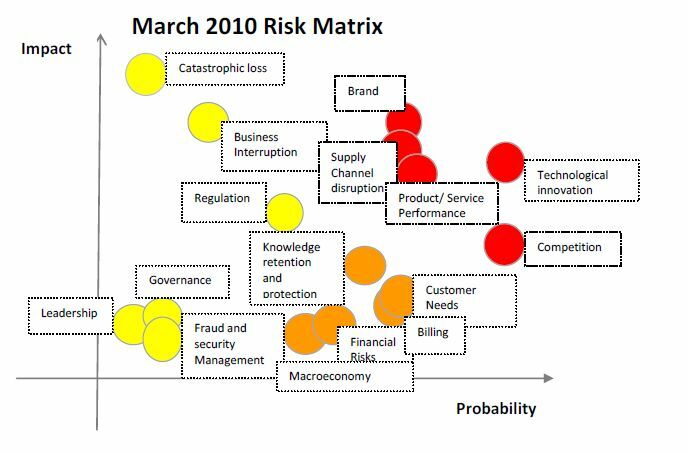 The following figure shows the risk matrix used by a European manufacturing company (call it MadeInEU) back at the beginning of 2010 (a few months after the beginning of the Greek debt tragedy). 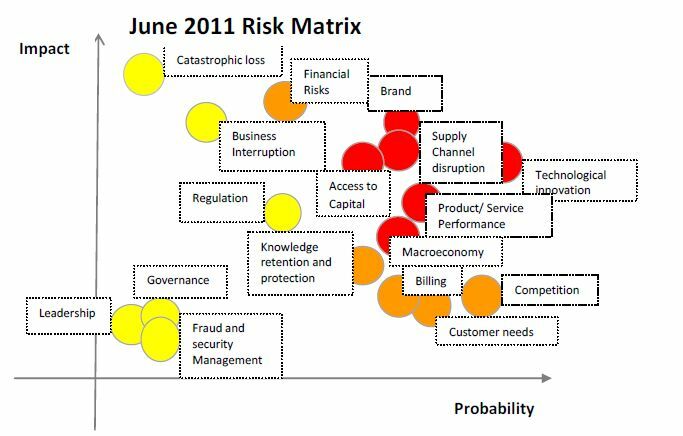 The risk matrix plots the different drivers of risk that matter to MadeInEU. The horizontal axis measures the likelihood of a particular driver of risk happening; the vertical axis measures how a driver influences operations, EBITDA and Cash flows. A heuristic combination of probability and impact helps managers rank the drivers of risk by their relative importance. The same risk matrix redrawn at the end of June showed a different picture. The most important changes that caught management attention were the significant upgrades in three drivers: (1) Macroeconomy; (2) Access to Capital; (3) Financial Risks (mainly related to the outlook for the Euro). Is E.ON’s trading unit profitable? E.ON, is a large European electricity and natural gas company. It manages its trading operations as a separate profit center. The traders are both responsible for optimizing E.ON’s own generation and other assets–sourcing inputs cheaply and maximizing the value of outputs–and also for running a proprietary trading book. E.ON just announced its second quarter results and was very candid about the fact that the outlook for the trading unit this year is not good. Indeed, it’s forecasting a loss in trading for the full 2011 fiscal year. The chart shows the reported ROCE for each of the separate units as well as the ROCE for the group as a whole. Not shown is the ROCE for the corporate center. 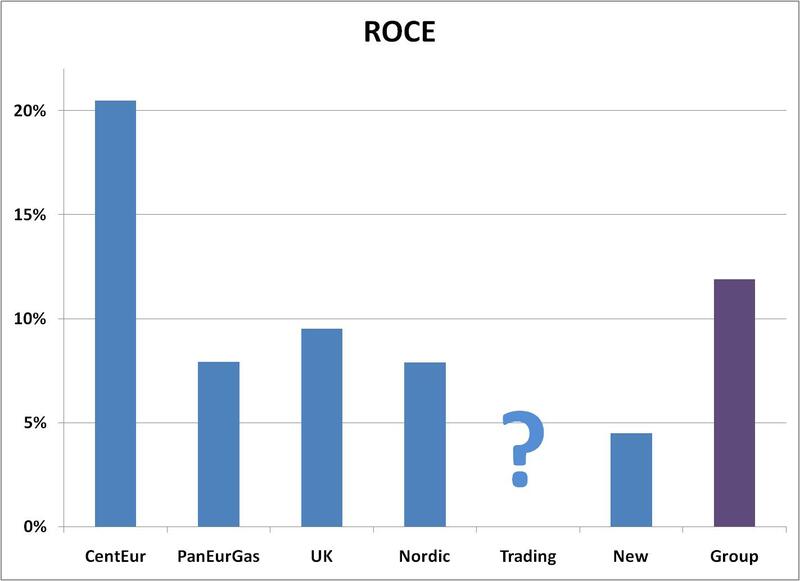 But EON doesn’t report an ROCE for the trading unit. Why not? Good internal risk controls involve carefully distinguishing between different types of trading. Many companies that do significant trading to hedge their market risks explicitly forbid proprietary trading. Others explicitly try to profit from proprietary trading, but it is still important to keep the proprietary trading book separate and under proper control. So, for anyone interested in this issue, it is instructive to watch the implementation of the Volker Rule — section 619 of the Dodd-Frank Act — which restricts the proprietary trading operations at the major banks. Last week, Politico’s Morning Money posted a study by Deloitte discussing how regulators might identify proprietary trading and the measures banks would need to take to clearly mark transactions as “market making” or other permitted activities as opposed to proprietary trading. While the Volker Rule is about banks, and this blog is about end-users, it will still be informative to end-users to watch how this process plays out at banks. After all, proprietary trading is proprietary trading, wherever it is pursued, and the fingerprints of proprietary trading are likely to be similar, too. Two other good reads on the telltale markers distinguishing proprietary and other trading are a paper by NYU’s William Silber, and an old paper by Braas and Bralver in the Journal of Applied Corporate Finance (paywalled). One of the most controversial aspects of the financial reform in the US and Europe is the mandate that many derivatives trades will have to be cleared in central counterparty clearinghouses (CCPs). CCPs stand behind the losses in the event that a trader defaults. To protect the clearinghouse against trader defaults, users of derivative contracts processed in CCPs will need to post margins. But margins are expensive; they require traders to have spare cash or unused credit capacity; and margins need to be explicitly accounted for. Opponents of clearing have directed their criticisms at these points, complaining that margins crowd out other corporate investment. They also argue that margins have negative implications at a more macro level: variation margins can trigger panics; and out of concentrating risk, CCPs will become dangerous dens of systemic risk. Altogether, clearing under the proposed rules won’t change things for the better, they argue. On Thursday last week, members of the US House of Representatives Michael G. Grimm (R-NY), Gary Peters (D-MI), Austin Scott (R-GA), and Bill Owens (D-NY) introduced a bill to add another dangerous loophole to the Dodd-Frank legislation’s capital and margin requirements on OTC derivative dealers. It’s even more difficult than usual for those not on the inside to grasp what is going on here. The press release is all about motherhood and apple pie, and the bill itself is all about amending Section 4s(e) of the CEA as added by section 731 of the Dodd-Frank Act so that paragraphs (2)(A)(ii) and (2)(B)(ii) do not apply when, blah blah blah. The real substantive issue isn’t touched on explicitly in either source. But here’s the deal as far as I can tell. The bill is an attempt to block swap margin and capital requirement rules proposed last April by a set of financial regulators. This bill demands that financial regulators turn a blind eye to certain specific risks on a bank’s balance sheet. If the risk arises from the sale of a non-margined derivative to an end-user, the bank is supposed to pretend the risk doesn’t exist. The regulator cannot demand that the bank hold capital against that risk. The four reactors at Fukushima Daiichi damaged in the March 11 earthquake and tsunami belong to the Tokyo Electric Power Co. (TEPCO). Not surprisingly, TEPCO’s financial situation has become perilous. In announcing its annual results, the company recorded a direct loss of more than ¥1 trillion ($12 billion). This does not include several significant additional costs. Several of TEPCO’s other nuclear reactors remain down in part due to the regulatory and political reaction to the accident. 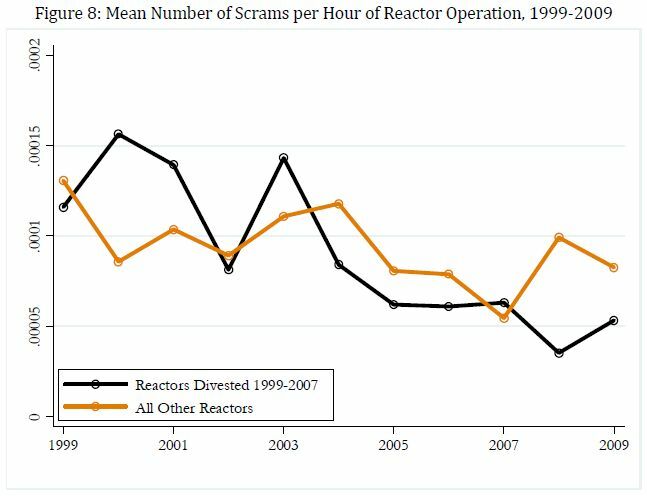 The company will need to purchase replacement power both for the four lost reactors, and for the add-on shut down reactors. Most importantly, the ¥1 trillion does not include the liability for the various types of damage caused by the accident. Estimates for the size of this liability range from 2-11 times the ¥1 trillion loss already booked. 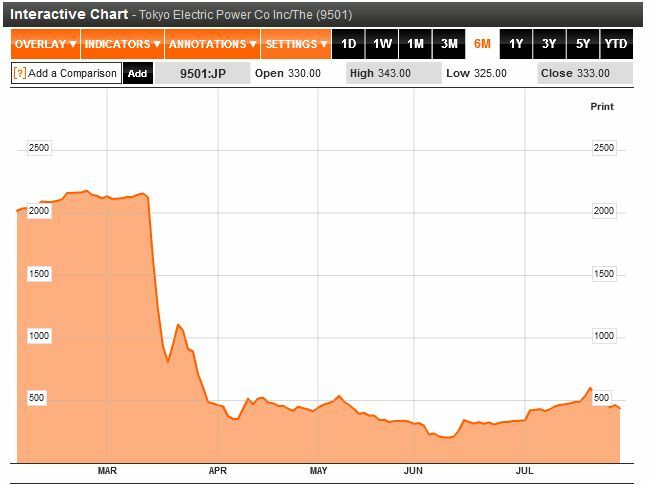 Following the accident, TEPCO’s stock quickly lost ¾ of its market value, or more than ¥2.7 trillion ($32 billion). It is widely believed that the liabilities from the accident make TEPCO insolvent, but for a government decision to support the company financially.